Water is a precious commodity, and without it we can’t grow food and survive. Yet industrial agriculturewastes water on a shocking scale, using open air irrigation and relying on fossil water supplies to grow food inefficiently. If we hope to meet the demands of surging human population, we must conserve our water resources through sustainable agricultural methods such as permacultureand organic agriculture. 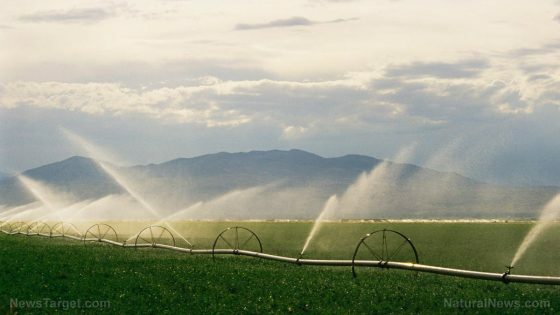 With many of the world’s largest aquifers now collapsing, much of the fossil water supply that feeds our world will be depleted before the year 2050. A global food collapse is now inevitable unless food production techniques are dramatically shifted toward sustainable practices. A food collapse, by the way, also means mass social unrest, revolutions and the toppling of world governments. Starvation inevitably leads to disease, suffering and mass death. Despite the coming food collapse, the agriculture propagandists tell us that genetically engineered crops will solve all the world’s hunger problems, but they refuse to recognize that GMOs need water to grow, too.